Chinese Cheongsam and also known as Qipao is the traditional Chinese dress worn by Chinese women nowadays, especially during special occasions such as Chinese New Year, weddings, traditional family gathering, etc. This type of Chinese clothing was introduced into China during the Qing Dynasty. By that time, all the Manchu women were commonly worn this type of one piece dress, which later known as Qipao or Banner Dress in most parts of the country, including the capital city, Beijing. But, Qipao was better known as Cheongsam or translated into Cantonese language which means “Long Dress” among the people around China’s Guangdong province because of their dialect differences. Despite the political revolution after the demise of Qing dynasty, Chinese Cheongsam is still among the favorite dress worn by women and eventually it become the traditional dress for Chinese women. Elegant dresses can portraits a woman’s beauty and elegance. Chinese Qipao is one of the dresses that can display a Chinese woman’s beauty, softness and modesty through clothing. Chinese Qipaos are made varies according to a woman’s figure, the cutting of this Chinese dress not only shows the natural beauty of a woman’s body, it also makes the women’s legs looking more attractively thin and graceful. The clothing designs of Chinese Qipaos are varies throughout the history. During the Qing dynasty, Qipaos were designed to be loosely fitted and long enough to cover a woman’s feet. It also generally made of silk and embroidered with different kinds of laces pattern trimmed according to the women’s social standard. For example, Qipaos worn by the empresses and royalties are usually embroidered with Dragon and Phoenix design patterns. Modern Qipao’s design generally has two long narrow opening at the bottom edge of this dress, so that women wearing it can move comfortably and at the same time, display the slender legs of a woman when she walks. Generally, its neck is designed to be high and collar fitted, the sleeves can be short, medium or long depends on individual needs or taste. It also designed to have sides button and waist fitted to bring out the beauty of a woman’s shape. Unlike other dresses, Chinese Qipaos are made for simplicity because it doesn’t need any accessories such as belts, scarves or sashes to go with it. 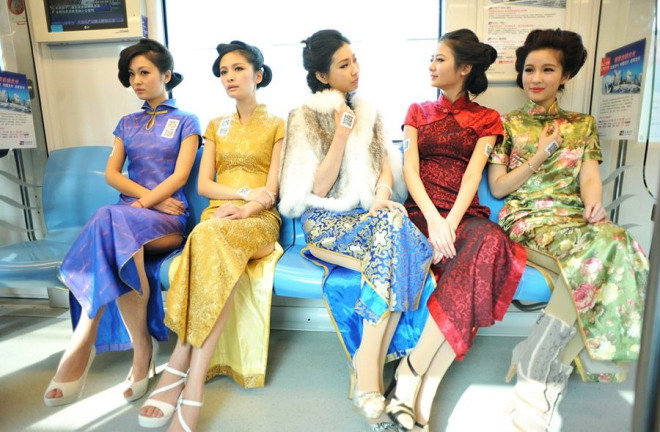 Today, Chinese Cheongsam or Qipao fashion has a growing popularity among Asian and non-Asian females. The creative designs of Chinese Qipaos by fashion designers with the combination of modern and past designs have make this Chinese clothing becoming one of the attention grabber in the Asian fashion today. One of the stepping stone that makes Cheongsam or Qipao becoming one of popular dress among eastern and western women is definitely through the power of silver screens or movies. Back in the 60’s, Nancy Kwan had briefly introduced Chinese Cheongsam into the western culture fashion through the movie, The World of Suzie Wong. In more recent movies such as Spiderman, where Kristen Dunst worn a traditional Chinese Cheongsam and the Hong Kong made movie, In the Mood for Love, where Chinese actress Maggie Cheung can be seen wearing the traditional Chinese dress in the movie. The awards winning and nomination of ‘In the Mood for Love’ in the international film awards such as 2000 Cannes Film Festival, 2001 BAFTA Awards, 2001 Australian Film Institute Awards, 2002 Argentinian Film Critics Association Awards and more had also increased the exposure of this Chinese clothing in the eyes of the world. The once traditional dress for Chinese women is now a fashionable trend around the world and endorsed by many Hollywood celebrities, such as Nicole Kidman, Celine Dion and many more. Please visit Celebrities in Chinese Qipao page where you can see pictures of celebrities wearing the traditional Chinese dress. This fashion phenomenon clearly shows that not only eastern women, but western women can also look beautiful and elegant wearing this traditional Chinese dress – Cheongsam or Qipao.